Attending conferences just got easier. Mira Mobile is the interactive conference app that gives you instant access to everything you need to know about your conference. Create personalized schedules, easily search the program for target speakers and even use conference maps to navigate the floor. 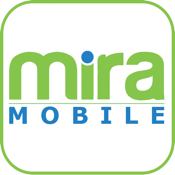 With Mira Mobile, you'll never have to worry about getting lost or missing an event again. Conferences made easy - everything you need right at your fingertips with Mira Mobile.